On It Like A Sonnet – Well Done! You may well have heard the great news that we’ve announced our finalists for the Poetry By Heart 2017 national competition – see here for full details – but this year that’s not the only exciting competition we’ve held! 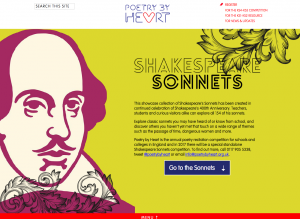 The Shakespeare Sonnet competition (aka ‘On It Like A Sonnet’) – videos were uploaded by 31st March 2017, and our judges have been going through those and picking the best recitations. It’s the first time we’ve been able to welcome students from Year’s 7, 8 and 9, as well as all school/college staff. Lots of people used this as a way to ‘dip their toe’ in the poetry recitation competition and we’ve been really enjoying the results! So, without further ado, here are the results! We all know that a magician never reveals his secrets, but as Poetry By Heart launched its special Shakespeare Sonnet Competition this year, inviting students and staff to memorise individual sonnets, it seemed only right to ask advice from a man who appears to have memorized them all. So in the interests of research, I went along to one of Peter Clifford’s magic shows. Early in the evening, Peter performed a memory feat in which he listed the titles of Shakespeare’s plays and narrative poems in chronological order, starting with Henry VI (Parts 2, 3 and 1) and ending with Two Noble Kinsmen. Impressive, I thought, but not quite The Complete Works. Using the method of loci (a memory strategy devised in Ancient Greece where images are mentally stored in an imagined building – see the NAWE article ‘The Old Man in the Attic’), plus a bit of focus and practise, I reckoned I could manage that myself. But then things got a little more complicated. Peter invited an audience member to the stage and handed her a battered copy of Shakespeare’s Complete Works. This was the spectacle my friend had raved about. Page numbers were turned to at random. Without fail, Peter recalled the first word on each and every one. Now this was impressive. And definitely not something I was about to try at home. Then he took things even further. Peter asked the page-picker to choose the first or second column on any given page and decide if they wanted the first or last word. After several increasingly rapid-fire demonstrations of this memory stunt, the entire audience was at the jaw-dropped-open-in-amazement point. But still, there was more. It turned out that, not only could Peter recall individual words from any page and column, but, as he went on to demonstrate in a final flourish of memorizing brilliance, he could also recite complete lines from every page. It appeared that my friend was right. Here was a man who had actually memorized The Complete Works of Shakespeare. Later I met Peter at a café and was immediately struck by his genuine enthusiasm and passion for all things connected with memory, performance and, in particular, Shakespeare. As well as being a magician, he is also a highly respected actor, director and writer, and has performed in numerous productions with the BBC, the Sheffield Crucible Theatre and the Shakespeare at the Tobacco Factory Company, amongst others. So the answer is, yes and no. But, interestingly, these mnemonic tools that Peter has so thoroughly mastered are not strategies he uses when actually performing Shakespeare. It seems the real trick to poetry and recitation is less to do with mnemonics and more to do with getting to know the words intimately, discovering the emotional truth beneath the lines and finding a way to deliver them that is truly your own. And, as we know from the best Poetry By Heart performances, that’s where the real magic happens. You’re Going To Our Finals! We will email your school’s main contact all the information and the forms you need to fill in and sign to attend the Finals Weekend. It is imperative that you respond as quickly as possible. We can’t wait to meet you at the prestigious British Library in London on 22nd and 23rd April 2017! Wow! What an unforgettable 3 of days non-stop video judging! Submissions poured in from all corners of the county; our judges had the absolute joy of watching and judging your videos over an intensive 3 day period. The Poetry By Heart judging panel gathered at Homerton College, Cambridge to watch, listen and experience your wonderful, passionate, raw and authentic performances. We were absolutely floored by how emotionally engaging your performances were, in school uniforms, on stages, in libraries – that personal touch in all of your videos has really impressed us, and we’re so glad to see some schools entering for the first time, bolstered by the online-submission system. Woohoo! We were particularly impressed with the range of poems selected this year too! Poems from our anthology popped up for the first time with fresh, passionate interpretations to bring them to life. We laughed, we cried, we hung on to every last word. We deliberated over your brilliantly nuanced recitations. We’re absolutely delighted to announce the finalists! A hearty WELL DONE to you ALL – whether you’ve made it or not, we loved each and every one of your videos. A great big thank you to everyone who participated this year – you are the reason Poetry By Heart is so absolutely fantastic!